Alesis brings a very simple percussion system which is so easy to use as well as versatile. Many of the performances are driven by sampling pads, because of its ability to trigger excellent and exciting sounds, loops and overlaying your performance with your own sounds and music. What Alesis brings to the fore is what each and every percussionist would want to carry around for his gigs. This is that kind of an instrument with which you can do you a lot of things unperturbed by the demands of being a percussionist. One of the main features is its futuristic design, with minimal and subtle User Interface which is quite easy to understand. You can do a lot of things with this sampling pad which I will explain in detail. I would like to say that it is whoever is going to use it, it is not going to be a hard job in understanding it but it is always going to be a very smooth ride. With minimal outward design complexity to understand, it is really simple to understand and playing will become even easier. So here is what you would want as a musician, a pad which you can use with your normal acoustic drum kit, your electronic drum set, or even use it alone in your gigs wherever you tour. 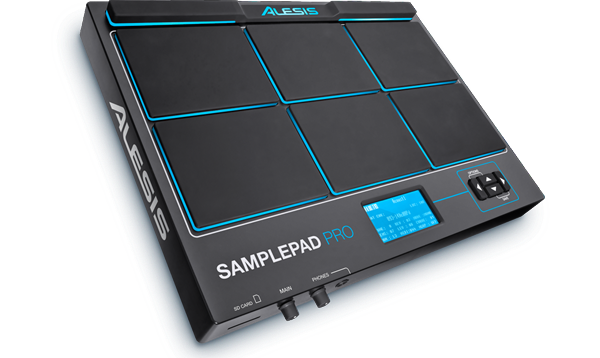 I will take you to a small tour to the Alesis Sample Pad Pro and what this amazing sample pad can do. As I mentioned earlier this is one of the most exciting designs you will find on any sample pad around. This is a futuristic design I would say. 8 super responsive and velocity sensitive pads, with a brilliant blue LED lights illuminating around each pad is a treat to watch. With the Alesis branding on the top which looks a bit like Asus can be a bit annoying to some, but I think you can live with that. A small LCD screen which is also illuminated with blue colour looks cool and fantastic as a Jarvis. The four buttons you will find on the right side just adjacent to the screen is the only navigating tool you will get to navigate through, which I suppose is a good move because it brings a lot of simplicity to the product. You need not to be Programmer to understand how to do your work on the Alesis Sample Pad Pro. What I really love about the design is, the engineers at Alesis have given us a design that is absolutely minimal. Means there is no complexity of a sampling pad riding on the design like other sampling pads around. The back is studded with ports which I will explain later but one of the new things with the design is the front panel too has knobs and ports which really great considering the fact that you don't need to bend over and over again for accessing any of those important ports. For me this is a very good design. One of a kind in the Sampling pad arena. As the front and back panels have some important ports I think I need to dedicate a separate sub heading for that. The back panel has some important utility ports which is quite handy. I would like to elaborate the important ones. The back panel comprises of the AUX IN which you can plug in your iPhones, iPods or anything that has an 8 inch jack. What is great is that it has its own volume control next to it, using which you can play along and practice. You can add additional pads like the Kick drum or the Hi-Hat trigger using the kick and the Hi-Hat input. Another feature is the footswitch port for attaching a footswitch, by which you can change the kits on the go, without using your fingers, and there is additional port for more pads as well. Then comes the main left and right outputs, then comes the MIDI in and MIDI out and last but not the least the USB port for adding your samples into the computer and vice versa. On the front side comes the all-important slot for the SD card supporting up to 32GB of storage, next is the main volume and the phone volume controls. Many may not like the prospect of setting up the volume knobs in the front panel rather than being on top which is a little bit easy to access, but I suppose it does justice to the minimalist design pattern of the Alesis Sample Pad Pro. These are the front and back panel features. Why do you need a Sample Pad? Suppose you are having your own electronic drum kit and you want other percussion sound to creep in your performance and make it a bit more interesting - the sample pad will help you. Suppose have acoustic drums instead and you need to turn it into a hybrid one and you need some loops, new sounds and music to your performance - the sample pad will help you to go in the right way or you need a small percussion pad which you can carry around with you in your arms for your short and fast gigs, sample pad is your answer. 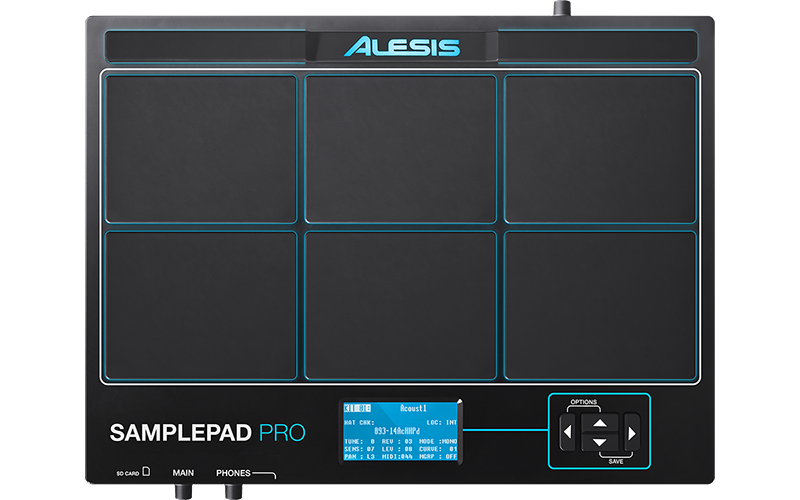 Now in what way does the Alesis Sample Pad Pro help you? The answer is it has a ton of features to help you use it the way you want. Comes with more than 200 high quality handcrafted sounds and 10 kits which are user programmable. 8 pads with dual tone feature, meaning you can assign two sounds on a single pad. Expand your Sample Pad by adding additional drum kits which takes this pad to the next level. Add your own sounds and play it. Play loops and tracks at will and have plenty of fun on the go. Blue illumination helps in playing even in dark conditions. All features mentioned above helps in making and playing your music and styles so easy with this versatile sample pad from Alesis. The performance of this Alesis Sample Pad Pro is as good as any percussion electronic instrument, the dual tone feature works really well and the dynamics of the sounds (how low or high a sound can get) is great. For instance if you hit the pad with subtle force and vary your velocity and force, there will be different sounds emanating from the instrument according to the force and velocity you apply on the pads. The feedback is great, superb sound quality helps in that feel of playing an actual acoustic drum kit, if you happened to play the kit. The design makes it even more enjoyable because of its good looks and futuristic design. Playing and using your Alesis Sample Pad Pro is always going to be a great joy. Pros: Good futuristic design, blue illumination makes it even more beautiful, good highly crafted sounds with kits which are easily customisable, A very minimal user interface, easy to use. Cons: The instrument itself could have been a bit thinner, the screen and the particulars look dated, the mains volume situated in the front panel can even be a bad move, more kits pre-sets could have been better. I would stay away from stating that this is the best sampling pad out there but it is good in its own right. The simplicity at which the design architecture is based on is a good one. The minimal knobs and switches make it less complex. The realistic and high quality sounds can be a good selling point. Alesis has done a great job in bringing this instrument into the market. If you are looking and pondering what to do in different situations like I stated earlier. You can straightaway go and buy one. Hope this article is useful. Keep Playing and enjoying. God Bless.